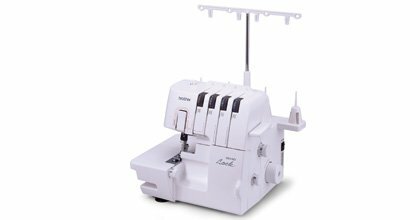 The new Project Runway Limited Edition 5234PRW is the first serger to be introduced into the Project Runway collection of machines. 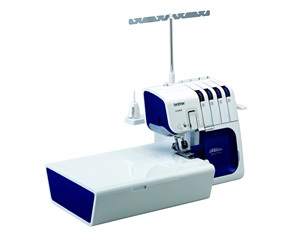 This new serger will add a professional look to your next project with serged seam finishes. Garment seams lie flatter and look better with an overlock stitch. Plus, home décor projects often suggest the use of a serger for rolled hems and secure seams and differential feed. Choose from a 2, 3 or 4 thread look and enjoy the new easy one-touch needle threader for threading two needles. The 5234PRW features two needles with a differential feed ratio of 0.7 to 2.0 for improved stitch quality. Create stitches from 2.0mm to 4.0mm in length and 5.0mm to 7.0mm in width. The included large extension table adds extra space for handling large projects and the free arm makes it easier to sew sleeves, trouser legs and other hard to reach places.